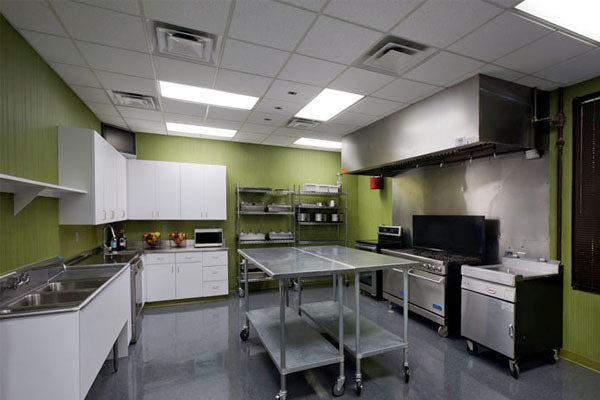 With more than 16,000 square feet under one roof, Jackson Associates' Perimeter facility can accommodate virtually any size or type of project. Spacious client lounges include private access to and from the building, as well as amenities rivaling those found in the best hotels. Mention Jackson Associates to get a discount on your stay. Courtesy van service within a 2-3 mile radius of hotel. Jackson Associates is less than 1 mile from the hotels, as is the Perimeter MARTA rail stop, upscale shopping mall and other shopping centers and restaurants. Superior Shuttle provides transportation to and from the airport. Various airline frequent flyer programs. Superior Shuttle - 770-457-4794. Pick-ups and/or return trips to and from airport. Reservations required. The cost is $35.00 for one way or $65.00 for round-trip. MARTA - Metro-Atlanta Rapid Transit Authority - Take the Northbound train to Dunwoody station (North Springs line - NOT Doraville). 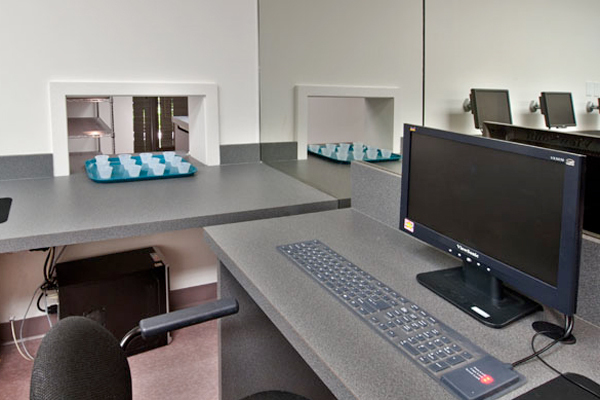 Dunwoody station is within a couple of blocks of our facility and taxis are readily available. The cost is $2.00 one-way. Our partner hotels offer free shuttle service from the station to the hotel. With 48 hours notice we will make arrangements to pick up clients at the Dunwoody station. Jackson Associates Perimeter is in the Perimeter Town Center office complex, located at the intersection of Hammond Drive and Peachtree Dunwoody Road in Sandy Springs. Turn left at Peachtree Dunwoody Rd. CROSS Hammond Drive. Perimeter Towne Center is on your immediate right. Take the second entrance into Perimeter Towne Center. Drive straight back. Jackson Associates is in Building H, two buildings behind Woodham's eye clinic. The entrance is on the lower level between buildings H and I. NOTE: It takes approximately 45 minutes to travel from Airport Station to Dunwoody Station. We will pick-up and drive clients to and from the Dunwoody MARTA Station (for faster service please make arrangements in advance.) Taxi service and hotel shuttle service may also be available. Otherwise, it takes approximately 15 minutes to walk from the station to our office. For more information on train schedules call MARTA at 770-984-7000 or visit http://www.itsmarta.com/. Take the NORTHBOUND train. At the Lindbergh Station, make sure you are on a train continuing NORTH to North Springs. If your train is continuing NE to Doraville, disembark and wait for the next train, which will travel NORTH to North Springs. Exit the train at the DUNWOODY station (next to Perimeter Mall). Follow the signs to Hammond Drive and turn RIGHT (going away from the mall). Continue 1/4 mile to the1140 Hammond Drive entrance. Continue to stop sign, locate campus directory for map. Jackson Associates is in building H, and the entrance is across the courtyard from building I. 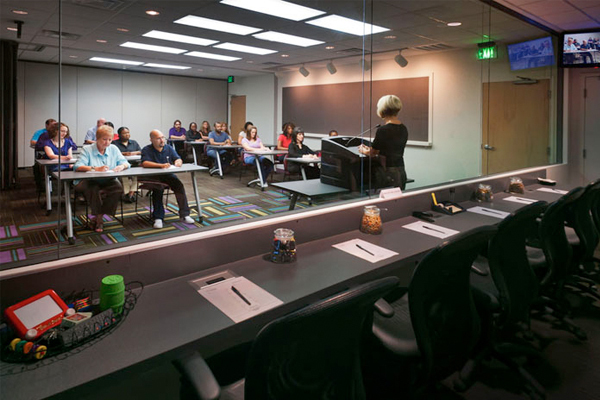 When our clients need more space than a traditional focus room they use our auditorium. 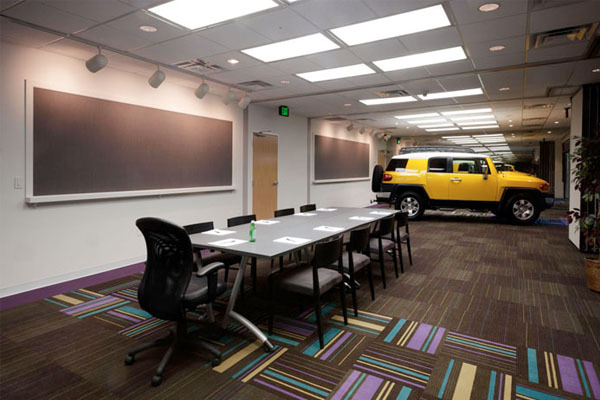 This room was intentionally designed to accommodate large items such as automobiles, over-sized displays. 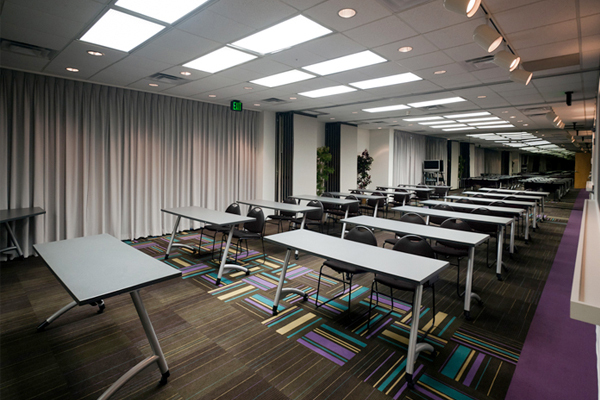 It is uniquely suited to host qual/quant projects, such as mock juries and perception analyzer tests. 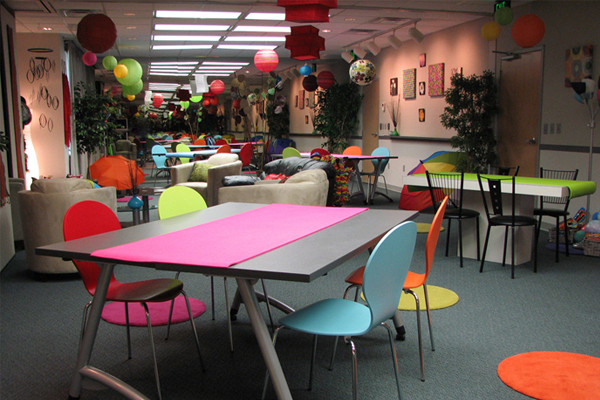 It is also ideal for large ideation and creative sessions. 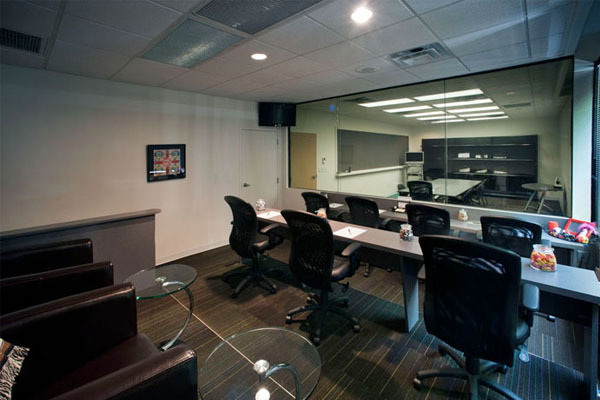 This 22' X 54' room has a viewing room with adjacent lounge at either end. 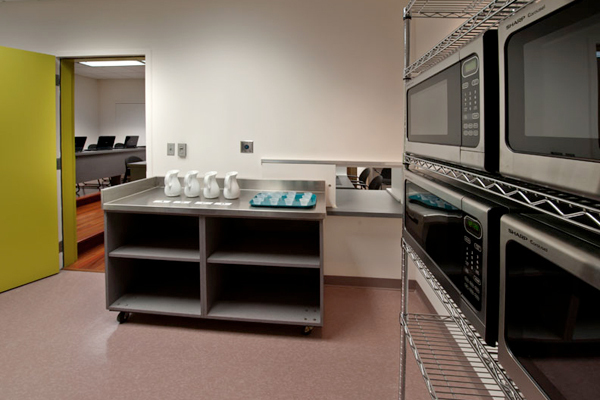 Display ledge and wall area for attaching notes, etc. 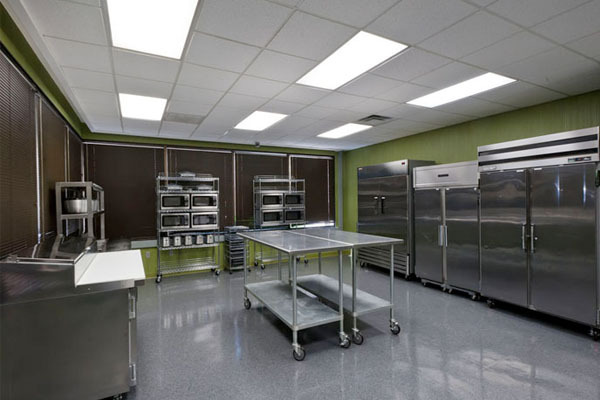 Our Perimeter facility has the largest commercial test kitchen in Atlanta and comes fully equipped to meet your needs. 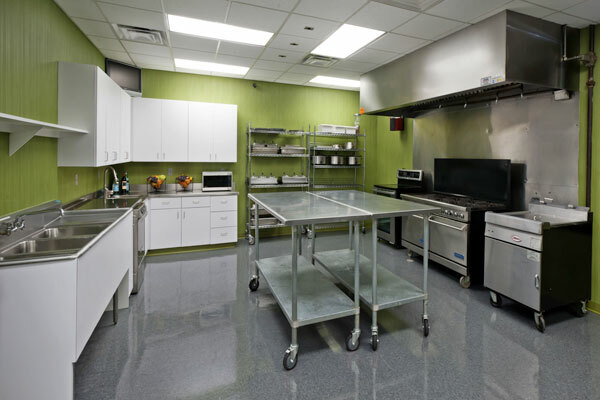 In addition to our commercial test kitchen, Jackson Perimeter has an additional test kitchen with an adjacent sensory lab. 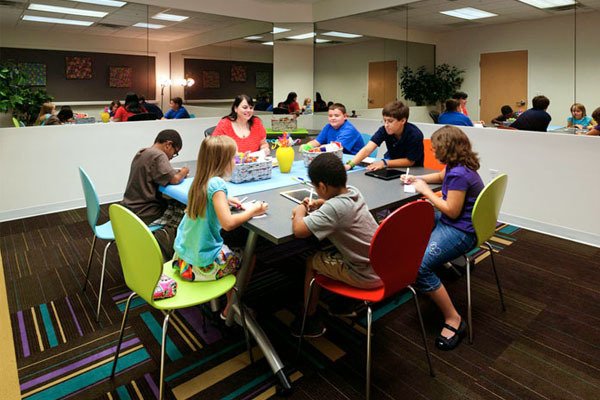 Our largest studio is often requested long ahead of time by clients because of it's spacious viewing room and luxurious lounge. 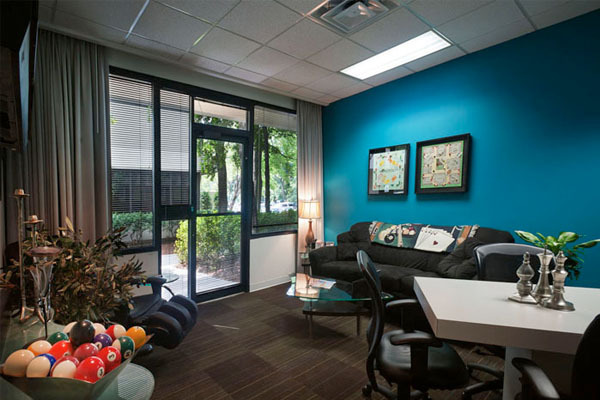 If someone needs to take a quick break from their research, they can either relax in our massage chair, or step out their private exit for a breath of fresh air or short walk through the breezeway. 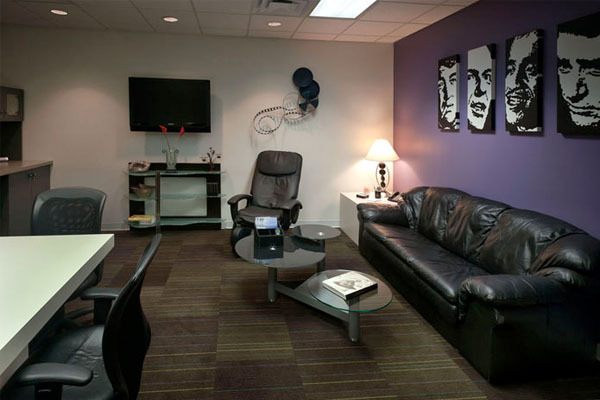 In addition, this studio has a private lobby, which offers an additional layer of security for high profile clients. Our "Art Studio" is filled with reproductions of the finest artists but nothing about the studio itself is less than original. 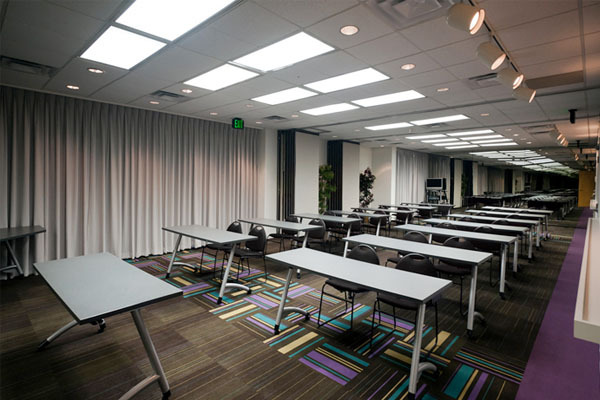 In the focus room, an expandable wall converts our standard 22 X 22 focus room into a 32 X 22 display area. Because of the 8' X 8' delivery door to the focus room, we are able to bring in these large items directly from the parking lot adjacent to our building. The Art Room is also half of our auditorium, so when both sets of our air walls are open the combination of this room and it's neighbor, the "Rat Pack Studio," create our 54' X 22' space capable of seating 100 theater or 75 classroom style. In a tribute to my father, we created this studio as a throw-back to another time when Frank Sinatra and gang were at the top of the charts. And our clients love it. This fun and flirty room is no less spacious than its more serious friends down the hall. 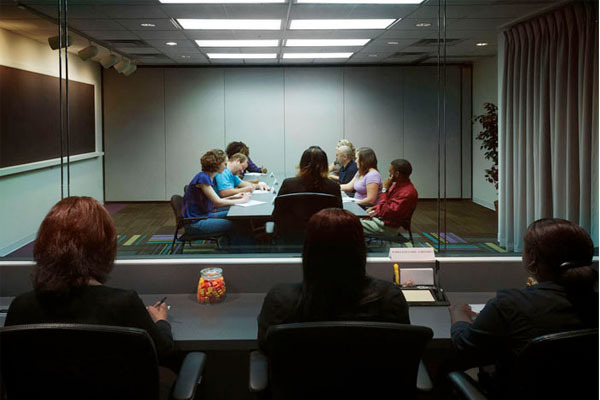 In the lounge, we have a large conference table that accommodates six for working on concepts or adjusting the flow of the group or interview...or just sitting together over a casual meal. New Orleans...here we come! 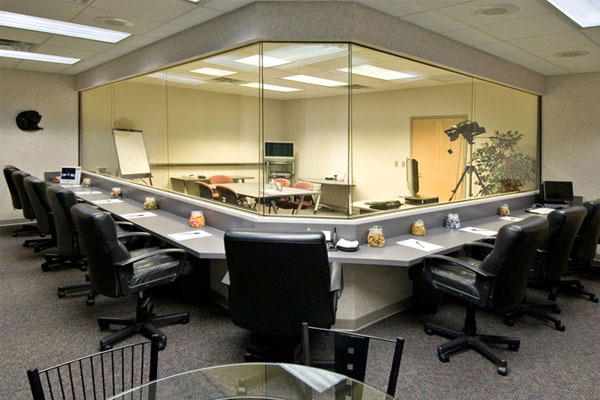 In our "Jazz Studio " every client has a seat at the mirror, which leaves our clients singing our praises. 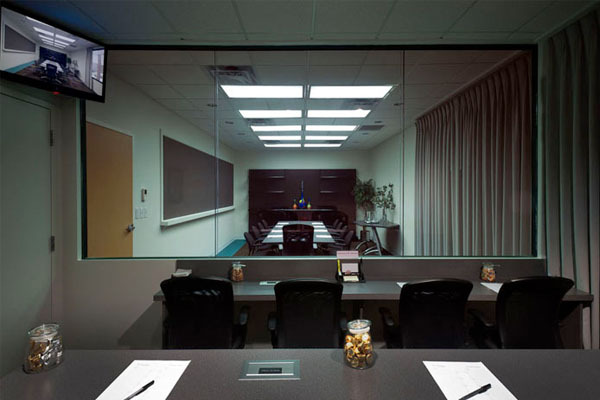 With clients seated at the glass, everyone has a clear view of our respondents and because we have two cameras (one mounted on each side of the viewing room) we can capture our respondents from two distinct angles simultaneously. Ask and we deliver! 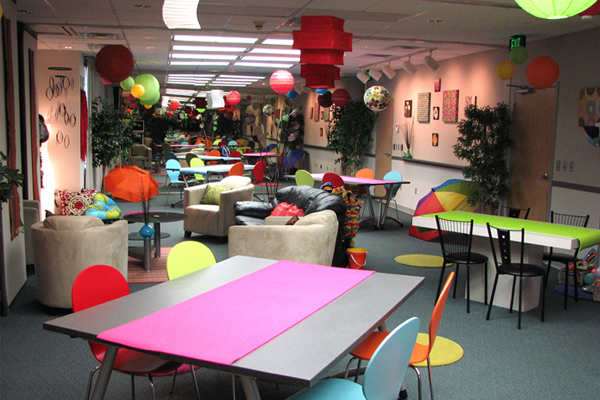 Our clients wanted a fun, funky space in our focus facility that was full of color and movement that would spark imagination. A place where they could work side by side with their customers to develop innovative solutions, creative ideas, tag lines, messaging statements - you name it. 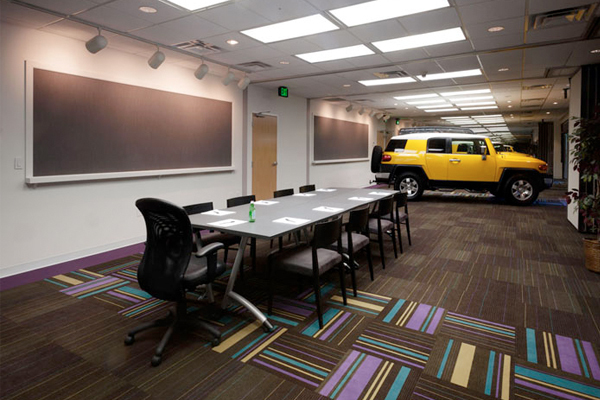 Our entire company pulled together to create this inventive space in our auditorium. 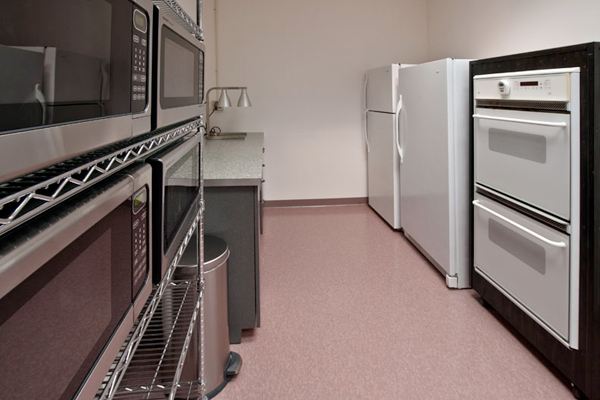 If a smaller space is available, just ask us! 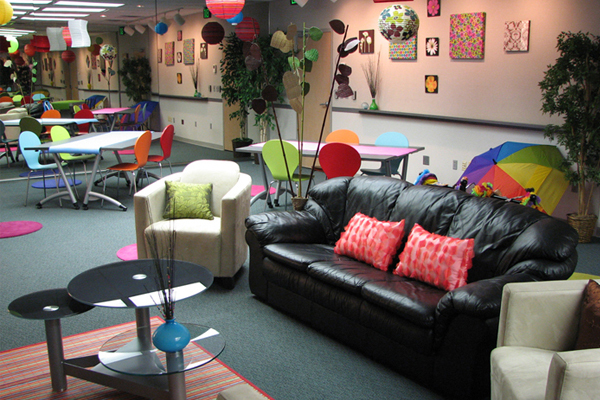 We can "create" this in any of our focus rooms.